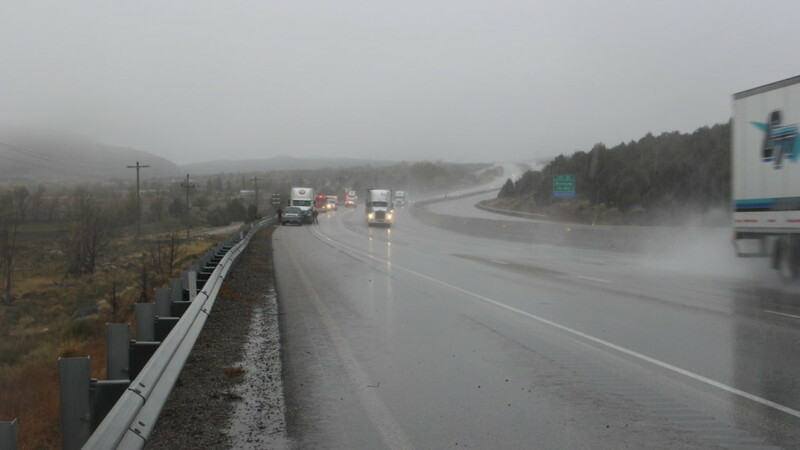 WASHINGTON COUNTY – Rain and snowfall in Southern Utah created slick road conditions on Interstate 15 that resulted in a passenger car colliding with a semitruck Monday morning followed by another car spinning out and striking a guardrail. Once the passenger car hit a patch of water, it spun to the right and crashed into the driver’s side of the semitruck’s cab. It continued to spin as it hit the first trailer, then the second behind it. 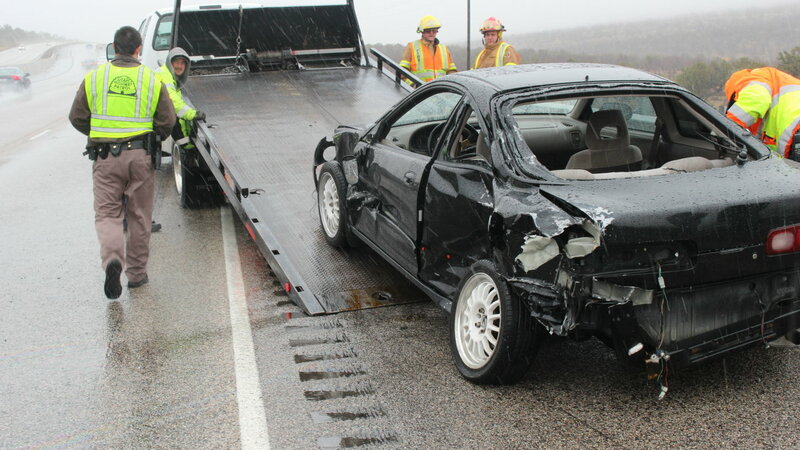 After clearing the semi, the car kept spinning out of control across the roadway until it made impact with the guardrail twice and finally came to a stop. 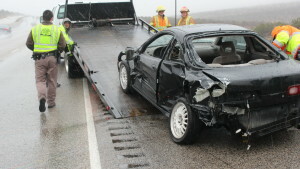 The car was facing westbound when it finally came to a rest, Pastor said. 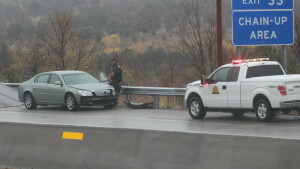 The passenger car’s driver, the only occupant in the car, was wearing his seat belt and escaped injury. The driver of the semitruck was also unharmed. 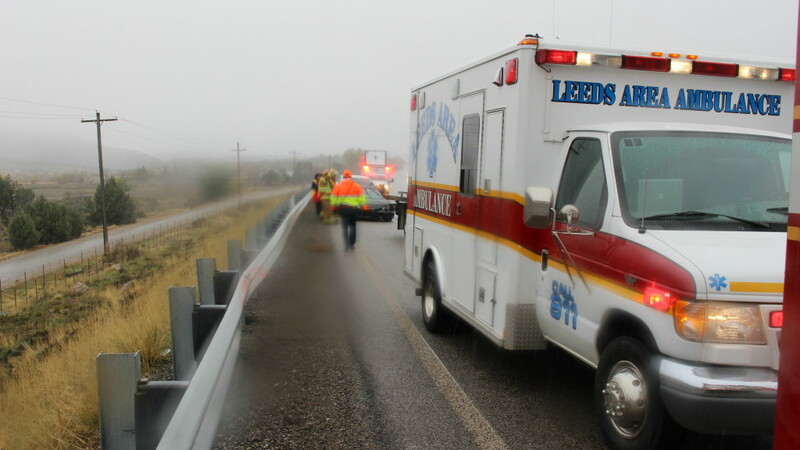 The UHP and other agencies received reports of the accident around 9:20 a.m.
Traffic around the accident was diverted to the far-left lane while the other lanes were temporarily closed as UHP personnel dealt with the scene. A unit from the Washington County Sheriff’s Office, as well as the Leeds Area Ambulance and Fire Department, were also on scene. The driver of the passenger car was issued a citation for failure to maintain travel in a single lane, Pastor said. Rainfall continued as responders took statements and eventually cleared the area. Near Exit 33, the rain began to give way to snowfall. With winter-weather advisories issued for much of the state through to 10 p.m. Monday, motorists are advised to slow down, be mindful of their surroundings, keep plenty of space between themselves and other vehicles and always wear a seat belt. . When inclement weather produces wet and icy roads, Pastor said, no one should be driving the posted speed limit. The speed limit is the maximum speed allowable in ideal driving conditions. “And obviously these aren’t ideal conditions,” he said. 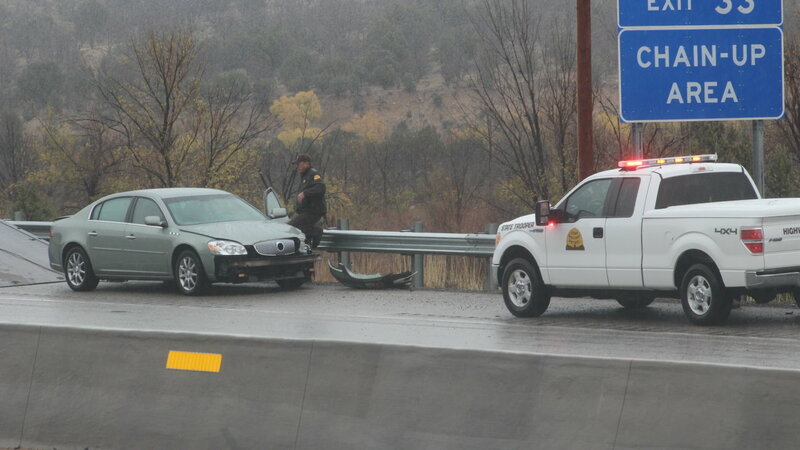 While responders were finishing with the car-versus-semi collision, another passenger car spun out on on northbound I-15 around milepost 31 and struck the guardrail. No injuries were reported in connection with the second incident.